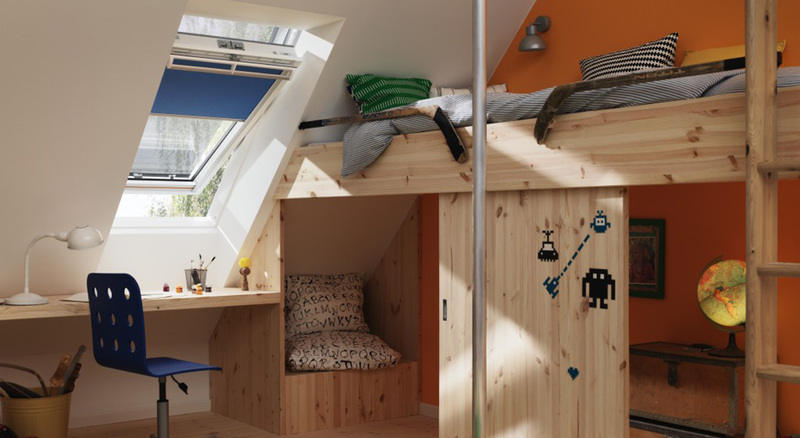 Scroll down to view a selection of Kids Rooms transformed by Child-Safe VELUX Roof Windows. A VELUX INTEGRA® remote-controlled Roof Window combined with a fixed lower sloping window in white-painted finish allow natural light to flood into this lovely playroom. 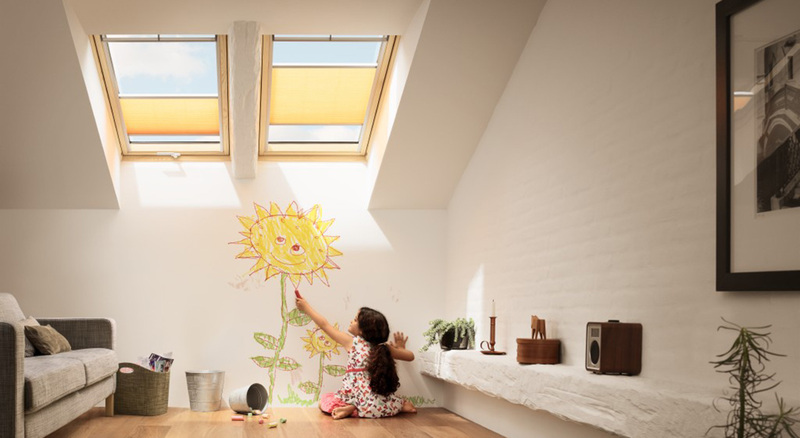 The VELUX INTEGRA® Roof Window can be scheduled to open and close automatically several times during the day to refresh the air and maintain a healthy indoor climate. 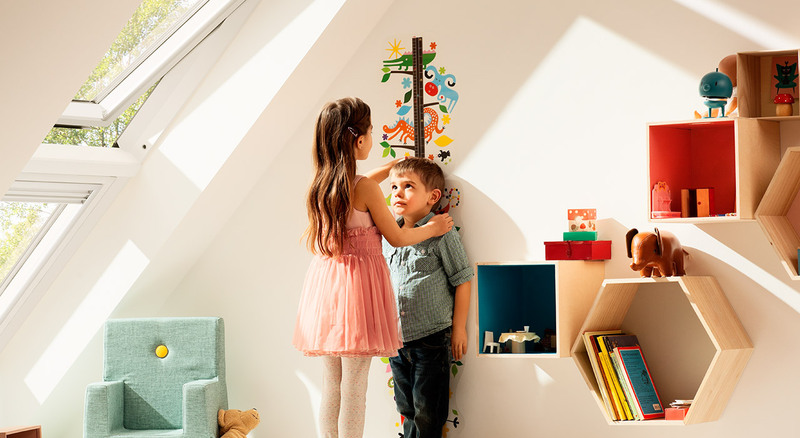 For added safety, a top-operated control bar is out of the reach of curious children! Because of their angle and position in the sloped roof, VELUX Roof Windows provide more light than traditional roof dormer windows. The VELUX Duo Blackout Blind showcased in this example is a blackout blind and a pleated blind in one easy to use unit. It offers the best of both worlds: total blackout or softly diffused natural light. A single VELUX Roof Window is all it takes to bring plenty of light to this upper storey child’s room. 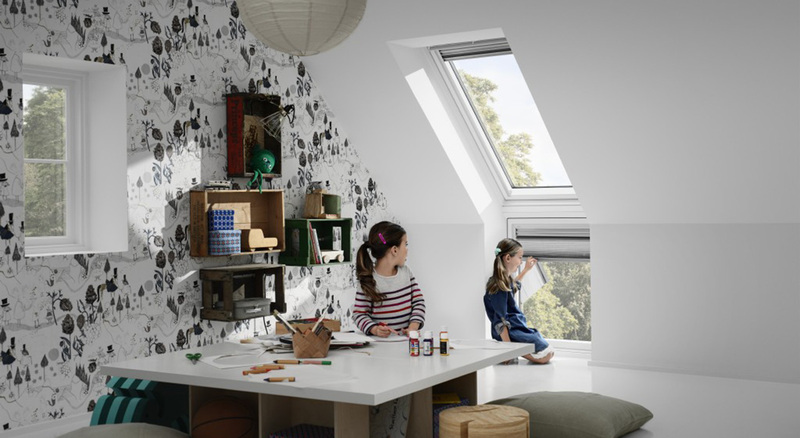 The convenient top operation of a standard VELUX Roof Window makes it easy to open the window even when furniture is directly below. The maintenance-free window requires no cleaning or repainting – just wipe down with a soft damp cloth if ever required. In this example, an impressive combination of a maintenance-free top-operated VELUX Roof Window with a vertical window element below creates a bright child’s bedroom. With plenty of daylight and ventilation, it is now the perfect room for sleep, homework, play and all other activities in a child’s day.